21-Jul-2011 -- The confluence point of 22° South, 60° West was visited on July 21, 2011, before noon. It is located within the Chaco region of western Paraguay. In South America, the Gran Chaco is a large region extending from eastern Bolivia, a small portion of southwestern Brazil, all of western Paraguay, and portions of northern Argentina. While the entire region is diverse, it can generally be characterized as a sparsely populated lowland area in the Rio de la Plata basin. Its climate is tropical or sub-tropical savannah, with hot summers and winter dry seasons. The Chaco is often described as an arid and inhospitable place with thick impassable low-lying thorny scrubland and natural forests. The closest town to this confluence is Filadelfia, Paraguay, which is the administrative capital of the Boquerón department (i.e. state). Over the past 75-80 years, Filadelfia has developed into a thriving agricultural town, based largely on cattle beef and dairy, with some crop production. Culturally the region is a blend of German Mennonites, Paraguayans, and several indigenous groups, particularly the Ayoro, the Niviclé, and the Lengua. Filadelfia is an oasis in an otherwise desolate landscape, and Hotel Florida is the best place to stay in town. Its outdoor patio is a comfortable setting for conversation over beer or yerba maté; here you will meet travelers from all over the world. Before the 1930s much of this land was not developed for agriculture. Since the arrival of immigrant populations from Europe and Russia, the region has fostered a productive cattle and dairy industry. Due to insufficient irrigation water, this region does not support large amounts of crop cultivation. Thus, the area has become divided into large privately owned estancias(ranches) for grazing cattle on grasslands created from clear-cut natural forests. The confluence point of 22° South, 60° West is located within one of these large estancias, approximately 40 km north of Filadelfia. Since there are no detailed road maps of the region readily available, in preparation for this site visit I used Google Earth imagery to establish driving directions along the rectilinear dirt road network. I hired a guide, Norbert Epp, who helped make this visit possible. As a local resident, Norbert called the estancia managers to get permission for us to enter the property. Once inside the estancia, there were 10 – 15 cattle gates we opened and closed en route to our destination. The landscape was visibly oriented towards cattle grazing: large herds of cattle, extensive fence lines and cattle gates, clear-cut grazing pastures bordered by natural forests, and the occasional dwellings of the ranch laborers. After driving about 9 km within the estancia, we reached a point where the remainder of the trek needed to be on foot. We parked approximately 800 meters (straight-line) from the confluence destination point. The next challenge was finding a spot to traverse a body of water and large mud fields. The Google Earth imagery indicated the confluence point occurs between two waterways, where thick forests were growing. Without proper mud boots or waders, it seemed at one point this site visit might become “attempted” rather than accomplished. After some creative problem-solving from Norbert, we were able to cross the mud field relatively cleanly (see figure 7). The rest of the trek was through low-lying scrub that was generally traversable on foot (see figure 9). Had this particular area been covered in the naturally occurring bush, it would have been impassable and the mission abandoned. On foot I simply followed the GPS location coordinates moving northerly and easterly towards the confluence point. The confluence itself is located in the thick impassable bush. We were quite fortunate, however, that a fence line existed along the 22° S parallel line. This allowed walking the last few meters into the bush possible, as the area immediately along the fence was clear and passable. 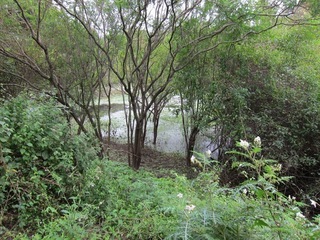 The confluence occurs in the bush, along a fence line, on a downslope towards a large lagoon (tacamar). The swampy, lush, and green qualities visible in the supplied pictures (figures 1 – 4) are not representative of the Chaco region as a whole. To support cattle, pasture land, and some crops, ranchers must collect and retain natural run-off water. Rain water is channeled and diverted into naturally low-lying areas, creating the tacamars (lagoons) visible in the North and East facing images (figures 1 and 2). Water is then pumped into large earthen built tanks (tanque australiano) for storage and dispersion. Returning on foot from the confluence to the truck was momentarily a challenge. With the thick bush and overcast sky, the landscape provided no features for orientation. In such a setting instinctual navigation can easily lead in the wrong direction. Thanks to the tracking feature on the GPS, we were able to get back on course and retrace our steps out.